February 1982. 11 months have passed since the last blog post, during which MTV launches in the USA in August, opening with Video Killed the Radio Star. In the UK the New Romantic movement is at its height with acts like The Human League and Adam and the Ants topping the charts. There are riots in Brixton and Toxteth, Eurovision victory for Bucks Fizz, and the Royal Wedding of Prince Charles and Lady Diana. While in Doctor Who, the transition from Tom Baker to Peter Davison’s Doctors is covered by The Five Faces of Doctor Who, the show’s first ever repeat season. It consists of An Unearthly Child, The Krotons, Carnival of Monsters, The Three Doctors and Logopolis leading up to the fifth Doctor’s first story in January. Peter Davison’s Doctor therefore arrived with not just the baggage of one but all four previous versions. In his first story, he was then obliged to do impersonations of all of them to represent the disorientation of his post-regeneration trauma. And in about 18 months’ time he’s actually going to come face to face with most of them for the 20th anniversary, at the same moment that his successor’s casting is announced. 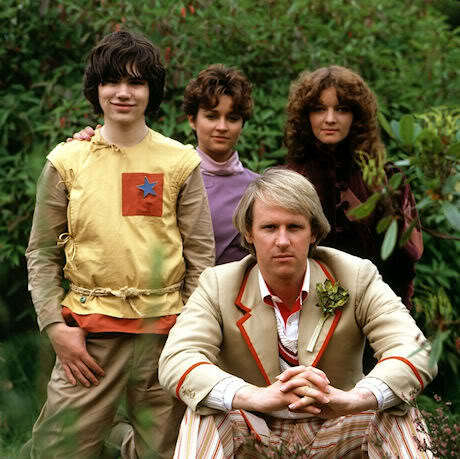 Right from the start, we’re constantly reminded that Davison is “the fifth Doctor” rather than simply “the Doctor”, and that pretty soon the sixth Doctor is going to arrive. It’s like turning up for a new job to find all your predecessors’ photos on your desk, and spotting interviews for your replacement going on in the boss’s office. The fifth Doctor is less of a Time Lord and more of a temp. Plus, Davison in 1982 was hardly the most obvious choice for the role, whatever Tom Baker might sniffily have said. In fact, he’s a blisteringly strange choice to cast as a 760-year-old alien. His previous biggest role was as the feckless Tristan Farnon in All Creatures Great and Small, and his other main TV roles at the time were the leads in two sit-coms: hapless Brian in Sink or Swim and house-husband Russell in Holding the Fort. Apparently John Nathan-Turner cast Davison after seeing a picture of him playing cricket and thinking how different from Tom Baker he looked. Which means that basically, Davison was cast to be Not Tom Baker. Most people would agree that Davison is very good at being Not Tom Baker. But then, almost all actors are, by definition, good at being Not Tom Baker. So it’s purely down to luck that Davison turned out to be so astonishingly good as the Doctor. Nathan-Turner later cast Colin Baker because he was very entertaining at a wedding reception, with rather different results. In a show where success is so often a happy accident, Davison’s casting probably counts as the happiest of all. Davison quickly discovered that no-one had really given much thought to what his Doctor might actually be like. The producer was most interested in the visuals – spending more time thinking about the Doctor’s costume than his character. The fifth Doctor is therefore almost entirely characterised by the way Davison chooses to play him: a kind of humble genius, easily distracted by small, beautiful things – in Kinda, by the wind chimes; later, and rather more fatally, by a few lumps of fused silica. In Kinda, he’s excitable and keen to go exploring even if it means leaving Nyssa – who’s feeling a bit faint – on her own in the TARDIS. When he’s faced with Hindle’s genuine madness, he tries to be reasonable. That’s this Doctor’s defining characteristic: reasonableness. In the future, he’ll even try to reason with the Cybermen and Davros. Later on in Davison’s run, the script editor Eric Saward makes this the fifth Doctor’s fatal flaw: that he tries to be a reasonable man in an unreasonable universe, and his attempts to broker peaceful, rational solutions merely prolong pain and suffering, and lead, inevitably, to bloodbaths. In response to this world full of hurt and horror, the Doctor adopts a kind of wounded sardonicism. But here, in Season 19, when the universe still seems full of wonders, he takes great delight in exploring it. Kinda opens with a joke – a man dressed in khaki putting on a mask to frighten a younger, dozing colleague. We quickly learn it’s a cruel joke, because the frightened man, Hindle, is understandably edgy, given four of his colleagues have wandered off into an alien jungle never to be seen again. The older man, Sanders, is determinedly unflappable, role modelling the fine British value of keeping a stiff upper lip. He thinks Hindle lacks backbone, too nervous, too by the book. The two speak the same language, come from the same culture, but don’t understand each other at all. Outside their base, which we learn is a dome on the planet Deva Loka, the TARDIS has arrived in the jungle. The Doctor, Adric and Tegan go exploring and find some strange wind chimes hanging in the trees. As these are the days before The Blair Witch Project, no-one thinks twice about messing about with them. The Doctor is quite taken with their tone: “A perfect fifth,” he says approvingly. He immediately searches for an explanation for the chimes, always looking for a reasonable solution. Adric impetuously rattles the chimes and runs off into the forest, and Tegan, suddenly dozy, drops off to sleep under them. The camera zooms straight into her pupil, and she starts having a dream that looks like a David Bowie pop video, full of strange, bleached-out characters and disturbing images. Back at the dome, Adric and the Doctor have been rounded up by an empty encounter suit and taken before Sanders and Hindle. Their arrival, and Sander’s laissez faire reaction, is enough to push Hindle over the edge into outright neurosis. When Sanders decides he’s going to go looking for the missing crewmen, leaving Hindle in charge, no-one thinks this is a good idea. But Sanders won’t be told anything, and goes anyway, leaving a broken Hindle to declare that he has the power of life and death over everyone. Hindle is the Doctor’s most dangerously human enemy: pitiful, if he weren’t in a position of absolute power. Simon Rouse’s performance is astonishingly good, and Davison, unlike some of his predecessors, is a wise enough actor that he’s happy simply to react to Rouse rather than try to compete with him. Davison is as good as Troughton in a very similar scene from his own 10th episode, The Underwater Menace episode two, in which the second Doctor questions Zaroff. Watching Troughton carefully edging round Furst, gently prodding the maniac, then stroking his ego, you can appreciate why Davison cited Troughton’s performance as a particular inspiration. Unlike Pertwee and Tom Baker, who focus on playing the Doctor in an interesting way regardless of what any of the other actors might be doing, Troughton and Davison play the Doctor’s reactions in an interesting way. To me, Kinda is a story all about people who can’t communicate with each other, and two cultures that are so different that they don’t even have a common frame of reference. Only the Box of Jhana can let the humans see through the Kindas’ point of view. It’s also about the difference between knowledge – the Doctor, Hindle and Adric always trying to work things out for themselves – and understanding, which the women of the Kinda tribe have, but which the male fools lack. Hindle’s break down happens in part because he’s unable to come to terms with this uncertainty: the ambiguity of the forest, things peering from behind trees, the dark places of the inside, threaten his sterile territory, his book learning and ultimately his sense of self. But to try to explain Kinda is almost to fall into its trap. You have to try to understand that the allusions and the symbols are just that – there is no one answer, it isn’t an allegory that can be decoded. If we try to explain the giant pink, papier-mâché Mara away as a Buddhist metaphor to excuse it, we’re only fooling ourselves. The reality is, with three script editors each pulling the author Christopher Bailey’s work in their own direction – Christopher Hamilton Bidmead towards hard science fiction in the style of Ursula K Le Guin, Eric Saward towards action adventure and more ready explanations and Antony Root, well, probably just to something filmable – there probably isn’t one straightforward solution. Kinda wasn’t even written for Davison’s Doctor. Christopher Hamilton Bidmead commissioned it in April 1980 for Tom Baker. It’s still possible to see how this could have worked for the sombre, rather more reflective fourth Doctor of Season 18, it has a lot in common with that year’s more poetic, experimental stories such as Warriors’ Gate and Full Circle where the biggest danger comes from failing to understand how the world works. Amazingly, more script editors worked on Kinda than on all of the Doctor Who stories from 1969-77 put together. That’s one of the reasons why Davison’s Doctor is so oddly defined in Season 19 – going from the excitable young Doctor of Four to Doomsday, to the gun-toting action man of The Visitation to the Hartnell throwback of Kinda with his half-moon spectacles and paternal attitude. Davison even gets two “first” stories – recording Four to Doomsday a few months before his broadcast debut Castrovalva. Nevertheless, thanks largely to Davison, the fifth Doctor can honestly say, “Whoever I feel like, it’s absolutely splendid. Ultimately, the lack of any one guiding vision for Season 19, the absence of a consistent tone or style works in its favour. The season is wildly inconsistent, but charmingly experimental, perfectly capturing the creative, reckless spirit of pop culture in the early 1980s. It’s not just the TARDIS destinations that are unpredictable, but the whole tone of the show. It picks up and discards Agatha Christie murder mystery, military sci-fi, pseudo-mysticism and psychological fantasy, with a new bi-weekly timeslot meaning each approach comes and goes faster than ever before. It’s like MTV flitting from one pop video to the next. And at the heart of it all, four leads under 30. After Season 18, dominated by old men with beards, Doctor Who has suddenly never looked so youthful, never moved so quickly, never seemed quite so full of its own potential. That’s all going to end when Eric Saward crashes a freighter into prehistoric Earth on 16th March 1982, taking the dinosaurs and Adric with it and casting a shadow across the rest of the fifth Doctor’s tenure. But for those two, wild months at the start of 1982, Doctor Who was new again, and a whole new generation fell in love with it. Next Time: “If it’s time to go, remember what you’re leaving. Remember the best. My friends have always been the best of me.” An old comrade and an old enemy return in Mawdryn Undead.